Sifting Through The Ashes, Part Six. – the donald VS The World – Summed Up In One Exchange. Meryl Streep, one of the most over-rated actresses in Hollywood, doesn’t know me but attacked last night at the Golden Globes. She is a Hillary flunky who lost big. For the 100th time, I never “mocked” a disabled reporter (would never do that) but simply showed him “groveling” when he totally changed a 16 year old story that he had written in order to make me look bad. Just more very dishonest media! Hum…the donald claims that he did not mock the reporter? Really? What do Y’all think THIS VIDEO shows? SO…How does this exchange of missiles demonstrate the basic problem with the donald in the Presidency? Once again, he demonstrates that he is both thin-skinned AND vindictive. 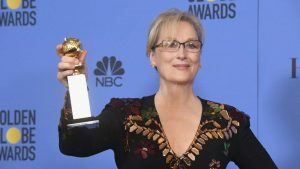 It might be acceptable to issue a public statement that he disagreed with Ms. Streep’s characterization of his demonstrating the handicapped reporter’s mannerisms. However, he went far beyond that point. Anyone that says anything that tweaks him is an enemy, to be slapped down hard…so, he starts off his rant by slagging her reputation, trying to weaken her comments with insults. He lies…blatantly, and almost constantly. To me, the above recording does show him mocking the reporter. In addition, his remarks about Ms. Streep are without merit either. She is not “One of the most over-rated actresses in Hollywood”. Even today, she can command the screen better than even 10 copies of the donald all clustered around squeaking for attention could do. She was NOT attacking him but was decrying his actions and speech, as well she should, as it was an ugly moment among too many ugly moments in the campaign. Finally, “100th time?” that seems a bit exaggerated, although it might be at least half way to the truth. His volatility is a problem (More on that in a bit). 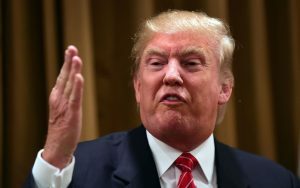 Do we REALLY want a person who can launch Nuclear Missiles in the position to do so, when he has shown that he is a chicken-hawk, and not only could become angry at a slight by a world leader, and launch, and, has a proven history of asking “What good is there in having Nukes, if we cannot use them”. 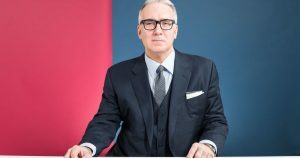 Olbermann. He is a very insightful, and articulate man, and recently posted a video aimed at the donald cultists in specific, and all Citizens in general, why he thinks there is something wrong with the donald. and offering suggestions on how to prepare for drastic action. He has known the donald for 20 years or more, and has interviewed him a number of times. This, to me, enforces the seriousness of his words. If you have not seen it, I strongly suggest you watch, and consider THIS VIDEO ESSAY. It is a powerful indictment of the donald, and bears serious consideration. Keith has lost his job at several News Channels because of his focus on the truth, and his outspoken rants that gore the ox of powerful people. One of the somewhat chilling things about this essay is that this is no rant…it is as calm and balanced as can be…He Means It. Not to dilute this entry, but I suggest visiting Olbermann’s YouTube Channel and watching other examples of his work. He is not always correct, and sometimes I feel he has gone over the edge…but, overall, he is one, IMPRESSIVE voice. Only 11 Days to go. This entry was posted in Ethics, General Thoughts, Political rants, Politics, Questionable decisions and tagged golden globe speech, Meryl Streep, Trump, tweets. Bookmark the permalink.